ESP improves the timeliness and completeness of public health surveillance by using near real-time data from electronic health records to generate automated case reports for notifiable diseases and up-to-date data on chronic conditions. ESP uses algorithms to detect infectious diseases, chronic conditions, and other events of public health interest (e.g. opioid prescribing, influenza vaccination, hepatitis C screening) using vital signs, diagnosis codes, laboratory results, social history, vaccine, and prescription data. For a full list of conditions and algorithms, please see the ESP wiki page. ESP also has modules used for syndromic surveillance of influenza-like illness and vaccine adverse event detection and reporting. ESP helps practices fulfill their obligation to report selected communicable diseases to public health agencies. ESP automatically detects most high frequency notifiable diseases and can submit electronic case reports to participating health departments. The Massachusetts Department of Public Health automatically integrates ESP's case reports into their electronic case management system. Automated electronic reporting improves the timeliness and completeness of case reports while simultaneously reducing reporting burden upon providers and practices. Case reports from ESP include data on patients' symptoms, comorbidites, treatments, and pregnancy status. Electronic case reports are sent by ESP to the health department's electronic surveillance system in HL7 format in an encrypted fashion. Longitudinal case reporting can be implemented for chronic infections such as HIV, hepatitis C, and tuberculosis. Clinical practices using ESP for notifiable disease case reporting in Massachusetts are eligible for Meaningful Use Credits for reporting to a Specialized Registry. ESP can help clinicians identify potential vaccine adverse events and report them to the national Vaccine Adverse Event Reporting System (VAERS). ESP will prospectively monitor vaccinated patients for new diagnoses, changes in laboratory values, allergies, or new medication prescriptions that might indicate a possible adverse reaction to the vaccine. When possible events are found, ESP sends the patient’s clinician a secure electronic message describing the possible event and inviting the clinician to comment and / or submit an automated, pre-populated electronic case report to VAERS. Adverse event reports are securely transmitted to VAERS as HL7 messages. Users select outcomes using dropdown menus, add filters using checkboxes, and can then choose to have the results displayed as heat maps, bar graphs, pie charts, or time series. Users can hone in on particular towns or zip codes for local information, compare rates between two locations, and stratify results into demographic groups or by comorbidities. The time series display allows users to specify an inflection point and compare trends before versus after the inflection point using an automated call to the R statistical software package. Multiple ESP instances can be configured into a distributed data network that allows practice personnel and public health officials to initiate custom queries against practices' ESP data for aggregated case counts. All queries are presented to practice partners for review and approval before execution. Practice partners also have the option to review results before permitting them to be released to the health department. 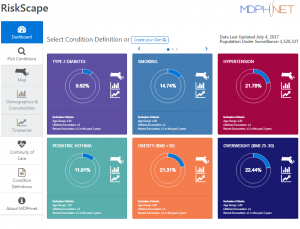 Query capability allows health departments and practices to obtain aggregate data on the incidence, prevalence, population characteristics, and patterns of care for patients with any of the conditions detected by ESP as well as any other conditions that users define themselves. Queries can be submitted using a point-and-click Query Composer or using custom SQL Code. Practices can customize how they wish to oversee and control queries from the health department. Clinical partners can query their own data. ESP's secure, web-based query engine is powered by PopMedNet, a free, open-source software application that facilities the creation and operation of distributed health data querying networks. Visit popmednet.org or their public wiki site for more information. ESP includes algorithms to identify patients at risk for key diseases. These include a machine-learning algorithm that estimates patients’ risk for acquiring HIV and the American College of Cardiology’s 10-year risk score for atherosclerotic and cardiovascular disease. These algorithms can be used to identify patients that might benefit from targeted risk reduction interventions as well as to assess preventative care practices among patients at highest risk for future disease.